Peter Veth accompanied the Director of UWAs Centre for Rock Art Research+Management, Jo McDonald, to France in February this year. Peter and Jo made a number of visits to key Paleolithic sites, including Chauvet, where they were hosted at the Ministerial level by Dr Geneviève Pinçon, Director of the Ministry of Culture and Communications. They visited the newly opened replica which has received more than 600,000 visitors in its first six months. 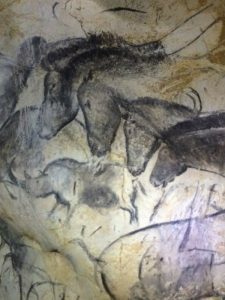 Colleagues Drs Gilles Tosello and Carole Fritz led the tour to Chauvet Grotte the Pont dArc (featured in the film Cave of Forgotten Dreams) and Le Tuc dAudoubert (featuring clay bison bas-relief sculptures). The visit to the Perigord also included a visit to Courgnac Cave and to the workshop where the new Lascaux IV replica is currently under construction. Jo McDonald was a Visiting Professor at the Université Toulouse 2 Jean Jaurès. Peter and Jo co-presented a lecture on ethnography with a specific focus on Kimberley rock art.